I've been thinking a lot about how we view kids' feet and all the commonly held views on kids' feet that, as new parents, we tend to absorb while we're learning the ropes of parenting. Things like, "let them walk barefoot as often as possible," and "don't worry if they're walking a little funny, they'll grow out of it." We just shrug and say "Okay, the experts are saying this so I guess it must be right." Well, I've always had issue with the first comment - walking barefoot. That works great for my friends Dave and Tami in Hawaii, where the kids spend much of their day on the beach or outside in general. Up here in the Northeast, we tend to have frozen tundra from November to March, so barefoot outside is impossible, and inside it's still too cold for little toes on those hardwood floors! Yes, there is something to be said when a child is first learning to walk about letting their feet touch the ground and learn how to work the muscles to provide the stability they need to move forward. However, once they've got it down, then it's more important to find them shoes that continue to enhance that muscle and bone development while protecting them from the elements. As for the outgrowing comment, while most kids sometimes do walk funny for the first few years, they may "outgrow" the behavior, but sticking them in shoes that don't have adequate cushioning arch support or stabalizing heel support can very well drive them down the path that many of us adults are finding - back aches, knee pain, foot pain. Much of this can be traced back to our childhoods when we were wearing shoes that didn't have the right inner support and cushioning to let our bones grow and muscles develop correctly. 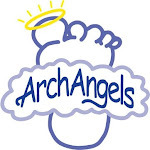 So, I disagree with the "experts" on this one - I've seen firsthand that putting Arch Angels in my children's shoes have made a difference today in their level of comfort and stamina, and I strongly believe that that difference will lead to fewer long-term problems with their feet, knees, backs and overall physical health. What do you think? Do you follow the conventional wisdom about minimal support when they're in their formative years? What did your pediatrician say to you if you brought up the fact that Timmy seems to walk on the outsides of his feet? I'd love to hear your comments!